For more July photos visit our forums. Garden volunteer Wendy Cutler has started a forum thread of photos of plants featured in this blog. Please post your own photos of the plants in our garden in this thread. Anticipating another hot, dry summer, it’s probably a good idea to plan a trip to the Botanical Garden to escape the heat, but also to see what last year’s hot summer can mean for flowers this summer. Even the later-blooming rhododendrons—famously happy in cool, damp weather—are blooming beyond any expectation this year. The Botanical Garden’s irrigation upgrade, has meant closures for parts of the David C. Lam Asian Garden. The undertaking involves the complete replacement of the aging irrigation system with a new more extensive and efficient system, as well as upgrades and extension of the main pathway through the Asian Garden. This exciting project will be extraordinarly valuable for the Garden’s plant collections—not least that there will be reliable irrigation on demand! But even with a few blocked trails, there is still plenty to see. As mentioned, some of the summer flowering rhododendrons are particularly floriferous this year. 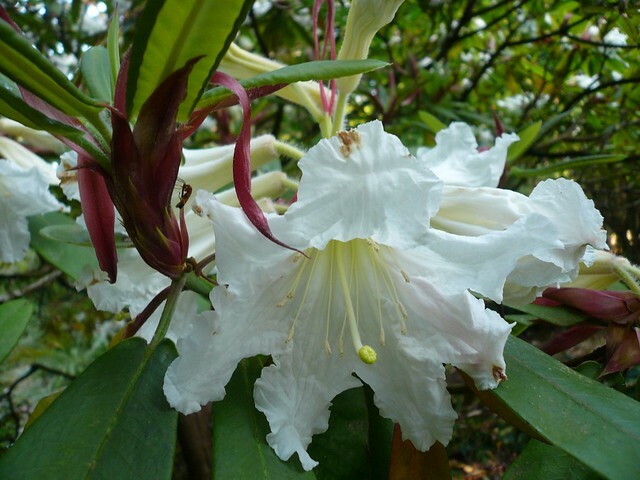 In particular, the tree-sized Rhododendron auriculatum (eared rhododendron) with its lily-scented blooms will be spectacular. There are several scattered around the Garden, but most are near Upper Asian Way and Ludlow Trail. Hydrangeas always put on a significant show in the Asian Garden, and there are many species, large and small throughout, but hydrangeas are also given pride of place elsewhere in the Botanical Garden. For example there are several plantings of Hydrangea quercifolia (oakleaf hydrangea) in the Carolinian Forest Garden, and a huge plant of the remarkable lacecap hydrangea, H. macrophylla ‘Mariesii Perfecta’ (also known as ‘Blue Wave’) in the Contemporary Garden. Speaking of the Contemporary Garden, that site has recently had a near complete makeover and will be ablaze with summer-blooming perennials. Flowers from around the temperate world are at their peak in the E.H. Lohbrunner Alpine Garden in July. Visitors can’t help but notice our spectacular collection of Kniphofia (torch lilies) and Crocosmia (montbretias) in Africa. In habitat, pollination of these flowers is carried out by sunbirds, a family of small, often iridescently-coloured birds with curved bills. Because sunbirds cannot properly hover (only hummingbirds can perform this feat), they must first alight and grasp the inflorescence to drink the nectar produced at the base of receptive flowers. Note that hummingbird-pollinated flowers, such as penstemons and Epilobium canum (zauschneria or California fuchsia)—check out the North American section for these—present their flowers more horizontally and on stems that are often supple and incapable of supporting a bird’s weight. Working one’s way up the slope to South America, Escallonia species and the spectacular lipstick-red flowers of Lobelia tupa (devil’s tobacco) are also magnets for hummingbirds. Next door in Australasia, these feathered pollinators are also known to visit Eucalyptus flowers and even the diminutive hebes, both of which are having banner years for flowers. Of course, if it’s hummingbirds you want to see, the Salvia tribe probably provides the most entertainment for visitors, and this year salvias will be better than ever. North and Central American salvias are almost exclusively pollinated by hummingbirds, but salvias and their relatives are native all around the Northern Hemisphere. Interestingly, hummingbirds don’t seem to mind that some salvias are insect pollinated at home. The Botanical Garden’s front entrance and Reception Centre patio are awash in a huge variety of salvias. Don’t miss the show this summer.